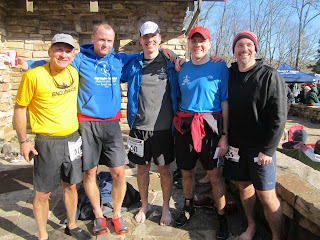 The 2012 Mountain Mist 50K race weekend started similar in the way it started last year. A bunch of us got together Friday night for a carbo loading pre-race dinner. However, instead of going to a local restaurant, April and Mike graciously agreed to have all of us over for a nice pasta dinner, girlfriends, spouses, kids and all;-) After enjoying a plentiful dinner with chocolate chip cookies for desert, different race strategies were thrown around, mostly to psyche me out. It seems that is is everyone's goal to try to mess with me in my quest to be the best ultra runner I can be. In other words, I ALWAYS want to beat everyone I train with and they get great joy out of messing with me and that plan;-) By 7:30pm, everyone was ready to head back home to try to get some much needed sleep before the big day. Unlike in previous years, this year runners had to pick up their race packet at the Monte Sano lodge the night before the race or on race morning. There was no FleetFeet store pickup this time:-( As a result, I actually showed up early on race day rather than running late like the last two years. This gave me the opportunity to look for familiar faces at the lodge and to double check my gear. After having run a few ultras over the past 2 years, I've come to realize that less is more at a 50K event and that all that extra gear really isn't necessary. After all, a 50K is just slightly longer than a marathon, right? However, I was using this year's Mountain Mist 50K as a training race for my next big event, the Fuego y Agua 100K in Nicaragua in three weeks, so I did run with extra weight and gear, just to get used to it. The Usual Suspects Pre-Race: Richard Trice, Mike Trice, yours truly, James Duncan and Ed Johnson (left to right). Unlike last year, we all filed out to the starting line 10 minutes prior to the race start. Last year, we almost missed the start. Mike and James tried to stay close to the front pack while Richard, Ed and I kind of settled in the middle of the pack. After a beautiful rendition of the national anthem and additional safety and race comments from the race crew (which couldn't be heard over the noise of excitement) the race was started with the traditional shot from a musket (at least I think that's what it's called). And as always, a bunch of folks got startled by the noise...including me. At 7:30AM sharp, a troth of 300 or so runners took to the beautiful trails of Monte Sano State Park for the 2012 edition of the Mountain Mist 50K. While the area had been unseasonably warm, there certainly was plenty of rainfall to ensure that this race, like all the other editions before it, would make for a memorable experience. The ice and snow of years past had been replaced with new creek crossings and mud, plenty of mud. I've read the comment "mudfest" in more than a few Facebook and Twitter postings after the race. While Mike and James literally took off sprinting, my game plan was to sit back and actually try to run a steady pace. I had no desire to be grasping for air before even hitting the single track trails. And while I understand the reasoning behind shooting out fast on this course (as to not get caught in the slow conga line as runners decent the single track trails), there were 30 more miles and plenty of opportunities and aid stations to pass folks. If anything, I'm a firm believer than starting out slow in an ultra is ALWAYS an advantage. I have heard plenty of runners of complaining about starting too fast, but never of starting too slow. Hey, you can always pick up your pace later....but I digress. Richard and I ran together for the first part of the race and I assumed that Ed was running ahead of us. When we arrived at the first aid station just before descending onto the Warpath Ridge Trail, an hour and three minutes had passed. I decided to run right through this one, while Richard stopped to top off his bottle. He quickly caught up to me again as I had slowed a little to carefully watch my footing as we descended this technical section of trail. I was still dealing with the fallout of a peroneal tendon tear in my right ankle in November of last year and while an ankle brace stabilized my ankle and provided a mental "security blanket", it did not prevent ankle rolls altogether as I had found out in some of my training runs. As we got dumped out onto the Powerline section, Richard and I were still running steadily together, him being as chipper as ever wanting to push the pace, me as cautious as ever telling him to slow the @#$%# down. As we reentered single track trail after the Powerline section with inches of mud built up at the bottom of our shoes, we continued at a fairly steady pace in the 9:30 to 10:30 min per mile range...until we hit the first of three well known climbs on the Mountain Mist course, K2. K2 send runners up 300ft along a switchback trail and this is where I started to slow down for the first time in the race. I was caught in a train of runners and instead of passing them, I decided to run/walk this section just like they did. I figured it'd pay off later in the race. During the climb up K2, I passed Rich about half way up. I figured he'd catch me again after the climb but that wasn't to be. I picked up my pace again, but I was now moving steadily in the 11 min per mile range as arrived at the second aid station at Three Benches at mile mark 12. Once again, I ran right through it. I don't know why but there is something invigorating about breezing through an aid station without stopping. Granted, my pace wasn't breaking any sound barriers, but it just felt good to pass the runners that had stopped to refuel. I continued to frequently take sips of water from my hydration pack. I had also started to take one energy gel every hour at the half hour mark and 2 SCaps every hour on the hour mark. That way, I spread out my food and liquid intake. It also kept my mind occupied. Other than that, I kept my eyes glued to the trail below me. My biggest concern throughout the day continued to be my ankle. As I headed towards the Stone Cuts, my average per mile pace stayed around the 11 min mark. I felt confident that I would be able to accomplish my goal of running a sub 6 hour finish, but I had decided all along that I would not kill myself in an effort to do so. At the end of the day, this was still a training race with a 100K and 100M race coming up within the next 5 weeks. As I entered the Stone Cuts, I heard someone above me shout my name. James? No way, this felt too early. I wanted to catch him, but this felt too early. Was I going faster than I thought after all? My favorite part of the race: The Stone Cuts. I continued at the current pace, feeling positive as I ran on familiar terrain. Aside from helping with marking the first half of the course this year, I also had been running this particular part of the course at least twice a week with my running crew. The Cold Springs trail section also included the small creek crossing that had turned into a major creek crossing during the last week. By this point, I was no longer ditching water puddles and mud, I was running straight through. As I continued on High Trail and Bluffline Trail, my pace now appeared to have slowed to 12 min per mile. These sections felt even more technical than usual due to the mud and exposed slick rocks. However, I knew it would get even rougher and more technical after the next aid station (#4) at the Land Trust parking lot. Again, I decided to run through it. I still had plenty of gels and water. Just after descending to the creek after aid station 4, I noticed a bright yellow shirt ahead of me, Ed. I had had no clue if we was ahead or behind me, and I was glad to see a familiar face again. Between keeping our eyes glued to the ground, we managed to chat for a little bit before he almost took a wrong turn. After that, it was time to refocus on the trails again and keep moving. By the time I reached the second major climb of the race, I was on my own again. Now it was time to climb up the infamous Waterline trail. I had trained on this section before this race more than in any other year, yet I decided to speed hike it again with a little bit of running threwn in. It was at this point that I slowly realized that a sub 6 hour finish was becoming very unlikely. Regardless, I decided to keep walking rather than running and if I had any energy left at aid station 5, I would try to push to the finish. While I'd lost a little bit of time over this section, it wasn't nearly as bad as I though it could have been. My mile split for this section was 20 minutes, which is okay this type of a hike. I arrived at the next aid station (#5) at the Trough Springs trailhead at a decent pace and finally stopped for some coke and a piece of banana. I wanted to ready myself for my last hooray of the race. Replenish and then see what you can do, that was my mantra. As I exited the aid station, I did manage another 12 min mile, but shortly after that, I realized that I would have to settle for 13 minute miles as the terrain, while descending, was just too technical to try to crash it like I have on previous runs. And I had the final climb left to go as well. That would add another 20 min mile to my time. Oh well, it was a nice goal to have, now I just wanted to finish in a solid time feeling good. I kept telling myself, "don't get worked up, it's just a training race". 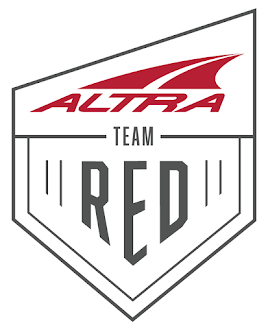 I don't know, but there is something about a popular local ultra marathon that just doesn't go with the term training race. So I reminded myself of my mantra from the previous years when I either struggled because I came out too fast or because I was undertrained: "Just have fun, enjoy the trails, the course, the mud, the folks!" And so I did. And if you need proof, look at ANY of the pictures that were taken of me during the race. I have never looked so happy in any of my race pictures from other races. There might be an occasional smiley picture, but in this race, I am smiling in every single pic and that means something, at least to me. However, there was one more thing left to do, pass Mike! As I continued my descent from the last aid station, I finally noticed Mike ahead of me, leading a group of runners. I did my best to sneak up on him and when I finally caught him and slapped his shoulder shouting sweet nothings into his ear, he didn't even jump. Oh well, we continued down McKay Hollow and Mike stayed right at my tail, making sure I wouldn't slow down. We picked up our pace ever so slightly until we reached the final climb, also referred to as Rest Shelter (as that is what you pass at the top of the climb). I could hear him shouting behind me, so I continued to push. While I wasn't running, I wanted to make sure I would at least speed hike up the climb. There's just something about one of your running buddies breathing down your back with less than two miles to go in a race. You just cannot let him pass you! I kept my eyes on a bunch of runners ahead of me, trying not to lose them. As I arrived at the top, I did what I had never done before. I skipped the two mystery food and drink items, took a small cup of coke instead and continued a slow shuffle to the finish. My third MM50K: I don't think I ever smiled that much at a finish. As I came around the final trail bend, I could see folks lining the finish area looking for their runners. Boy was I glad to complete this thing and you can see just that written all over my face. This was my favorite Mountain Mist finish by far and I can't wait to do it again next year. I did manage to course PR by 21 minutes, even though I stayed relaxed and never really raced. After the 5 of us completed the race, it was time for the post race picture, coke, pizza and cake. As I had done after my last ultra finish, I went home and emptied the ice from our ice maker out in our bathtub before entering the tub myself for a 15 minute post race ice bath. It seemed to have really helped my recovery last time, so I figured why not keep doing it. I also downed 24 ounces of Endurox R4, a Protein/Carb recovery drink to help with my muscle recovery. I also realized that I might not have taken in enough water during the race as I still had a half a liter of water left in my hydration bladder. Either way, I felt good after the finish with no cramps or unusual chills. The CamelBak Octane XCT pack worked great and I'm sure it'll work just fine for my 100K volcano race next month as well. Last but not least, I did not get a single blister which is remarkable considering that my feet stayed wet the entire time. I also did not deal with any of the other usual ailments of bruised feet from the technical terrain (pointy rocks) or Morton's Neuroma, which I've had to deal with aplenty in the past as well. I am hoping this is all part of my body getting used to more distance, but I will find out for sure at my next big ultra events. Great race report! Sounds like you had a good one! @Serena, yes I did and thanks for your comment.